Actors get their names in movie credits, but very rarely do cars.Nevertheless, there are films that have featured a sports car that stole the scene and merited having its make and model mentioned in the credits.There are a number of cars that have been in great movies, but at least 5 really standout. 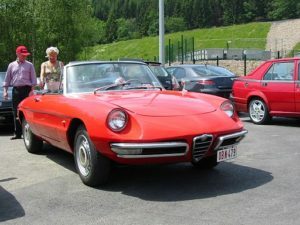 Dustin Hoffman was told that the future was in plastics, but he depended on the metal of his graduation gift, the cherry red Alfa Romeo, to get him to the church on time. The car was featured in numerous scenes and used in the some of the most critical moment of the movie. The post apocalyptic Australian desert was patrolled in style by Mel Gibson, who was Mad Max. He zipped across what was left of civilizationb in a 1974 XB Falcon V8 interceptor. Mad Max may have been a formable foe and beat up the villains, but although road weary, the XB Falcon cut a dramatic silhouette as it crossed the Australian wasteland. If Americans were asked to name a British sports producer, they would probably name Astin Martin who is the maker of the Astin Martin DB5.The popularity of this sports car is directly attributable to James Bond, played by Sean Connery. Having James Bond behind the wheel would make any sports car look cool. But the Astin Martin would have looked cool anyway.The popularity of the Astin Martin was so high that the original sports car was stolen in 1979 from a Boca Raton, Florida airport. Even without its time travel abilities, the DMC-12 was very hard to forget. The DMC-12 did not sell as well as its creator, John Delorean,had hoped, but it became one of America’s icons after it appeared in Back to the Future films. The movie franchise and the stainless steel DMC-12 are inseparable in the minds of the public. One can’t talk about the Back to Future movies without mentioning the car. Regarded by some as the king of cool, Steve McQueen, who acted in the movie Bullitt, will always be remembered for the chase scenes through the hilly roads of San Francisco. Steve McQueen took this famous ride in the 1968 Mustang GT390. Today this particular Mustang is still looked upon as being one of the best built in the franchise’s history.